Photographer unknown at this time. 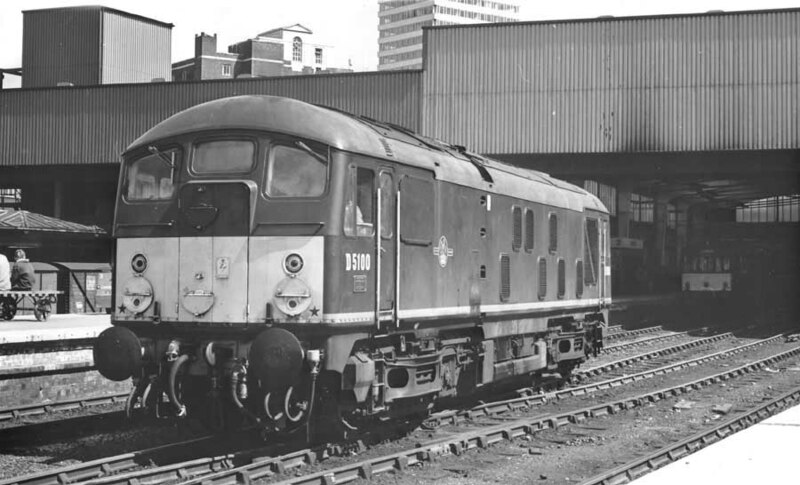 D5100 at Leeds City, date unknown. The fifteen year seven month career of D5100/24100 was split between North Eastern Region (11 years) and Scottish Region (4 years) allocations. May 1962 to Carlisle Canal on loan. May 1962 to Gateshead (52A). March 1963 to York (50A). April 1967 to Holbeck (55A). 24100 was stored at Eastfield from August to October 1975, then moved to Carstairs until April 4th 1976 when it was forwarded to Doncaster Works and was broken up there during May 1976. Movement: 24100 Carlisle - Doncaster April 4th 1976. Noted Darlington Works October & November 1963. Noted Brush Works, Loughborough November & December 1965. Noted Glasgow Works October 1973. Noted Crewe Works June - September 1974 (continuous?). 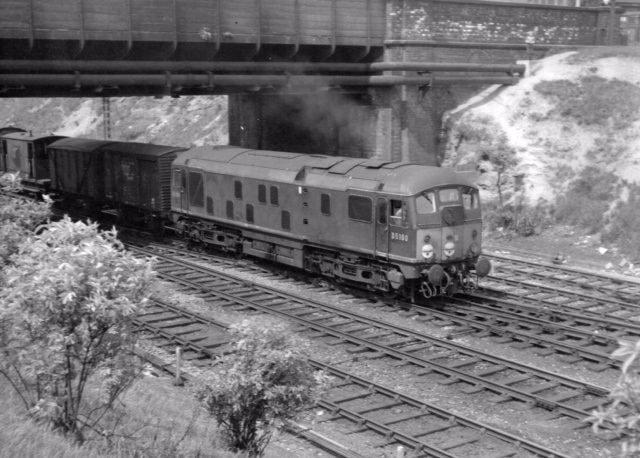 D5100 was delivered from Darlington Works to Gateshead on June 25th. By the end of July the Type 2s were being used in pairs on the 12.05 York - Glasgow relief, one such working noted behind D5100 & D5096. Condition August: green livery with frame level stripe, steam style shedplate on cab front, shortened fuel tank, full size water tank, ridge sided sandboxes, three-rung bogie mounted footsteps, engine exhaust in original position. Condition August: green livery with small yellow warning panels, curved upper corners, steam style shedplate on cab front, shortened fuel tank, full size water tank, ridge sided sandboxes, three-rung bogie mounted footsteps. D5099 & D5100 were transferred to York during March, and along with a number of others was partly responsible for the closure of Scarborough shed on May 18th 1963, the steam freight workings being replaced by D5096/8/9 & 5100/76 the following Monday. The first working was turned out by Gateshead allocated D5178. On May 28th the first turn, the 04.30am York - Scarborough led by D5100 was piloted by 77004, which was destined for the Malton - Whitby freight. However cinders from the ashpan set alight to the diesel necessitating the service of the Malton Fire Brigade. The service resumed behind 77004, the diagram later being taken over by D5099 which would fail on the last leg of the run, at Rillington on the 07:49pm Scarborough - York mail. Rescue came in the form 43014. D5100 was noted at Darlington Works during October & November. Photograph courtesy Graham Liversidge. D5100 at the east end of Marsh Lane cutting sometime during 1964. On Sunday March 7th D5100 was stabled at York, along with D5096, D5098, D5099 & D5239. After the closure of Darlington Works the NER Type 2s visited a number of workshops for their heavy maintenance & repairs. D5100 was one of several Type 2s to visit the Brush Works at Loughborough, being noted there in November & December. With the winding down of the Brush Type 4 construction Brush signed a contract with British Railways for the repair of various Sulzer powered Type 2/4s, in particular the major refurbishment of the Class 46s. Photograph courtesy G W Sharpe. 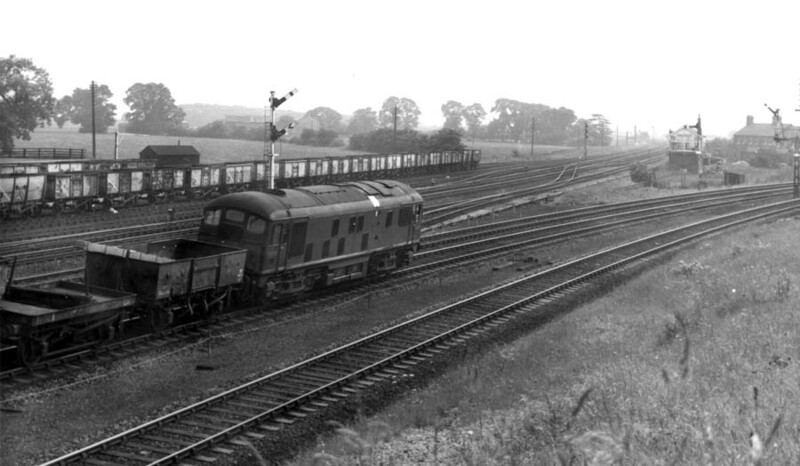 A work stained D5100 leads a freight at Church Fenton during September 1966, taking the line towards Leeds. The Type 2 reveals that it has a new shiny panel to cover the roof mounted water filler - these did not last long in service - eventually they would not be replaced. D5100 was at Derby Works during November. D5100 was transferred to Leeds Holbeck in April, and was joined there by D5101 in October. An Open Day at Leeds Holbeck on September 30th, no doubt celebrating the twilight of steam in the area, especially the few remaining Jubilees, found the following Sulzer Type 2s on ‘display’: D5096, 5100/73/79, 5254/90, 7526/48/68-70/95 & 7625. On the last day of March 5100 worked a football special from Huddersfield to Middlesborough. On October 6th 5100 & 8568 were in charge of the 8Z26 00.30 Dalzell New Yard, Motherwell to Carlisle freight, it was made up of thirty four wagons and a brakevan. The train was 1,279 feet long and weighed 814 tons including the locomotives. Half of the train was made up of loaded steel wagons, the remainder were container flat wagons, some loaded, some empty. Whilst descending Beattock bank at about 35mph the train was hit in the rear by the following 6V51 01.40 Dalzell New Yard, Motherwell to Margam steel train hauled by Class 47 1836, this train having become a runaway due to the incorrect coupling of the air brake pipes on this train. The collision occurred between Beattock South Signal Box and Murthat, with the out of control Margam bound train running away in excess of 80mph. All of the twenty four wagons behind 1836 were damaged, fourteen beyond repair. Nineteen wagons in the leading train were extensively damaged, eleven were eventually written off. The Class 47 sustained major collision and fire damage, the crew escaped serious injury, but tragically the guard on the Carlisle goods train was killed when the brake van was demolished. The permanent way and related structures were damaged for about half a mile, the line not being reopened until October 11th. Condition September: green livery with full yellow cab fronts, frame level stripe, gangway doors fitted, valencing removed, shortened fuel tank, full size water tank, ridge sided sandboxes, blanking plates fitted, hand/footholds plated over, three-rung bogie mounted footsteps, engine exhaust in original location. Condition June: green/yellow livery, gangway doors present, blanking plates fitted, hand/footholds plated over. 24100 was noted at Glasgow Works during October, possibly it was renumbered into TOPS during this visit. 24100 was noted at Edinburgh Waverley on July 31st 1975. 24100 was placed to store on August 8th 1975 and withdrawn on February 2nd 1976. Condition final: blue/yellow livery, gangway doors sheeted over, headcode discs centered on cab front, full size water tank, shortened fuel tank, blanking plates fitted, hand/footholds plated over, ridge sided sandboxes, two-rung bogie mounted footsteps. Page added September 15th 2016. Last updated May 4th 2018.